You can take one look at Travis and see that this handsome boy was meant to be a show dog. Look a little harder and you’ll see why he’s not – lucky for us. I had wanted to bring a dog into our home for what seemed like forever. There was just one problem – my husband is a cat person. He had never had a dog growing up and the thought of having one wasn’t really sitting well with him. Eventually I convinced him that a dog would be a great addition to our little family and he "gave in". 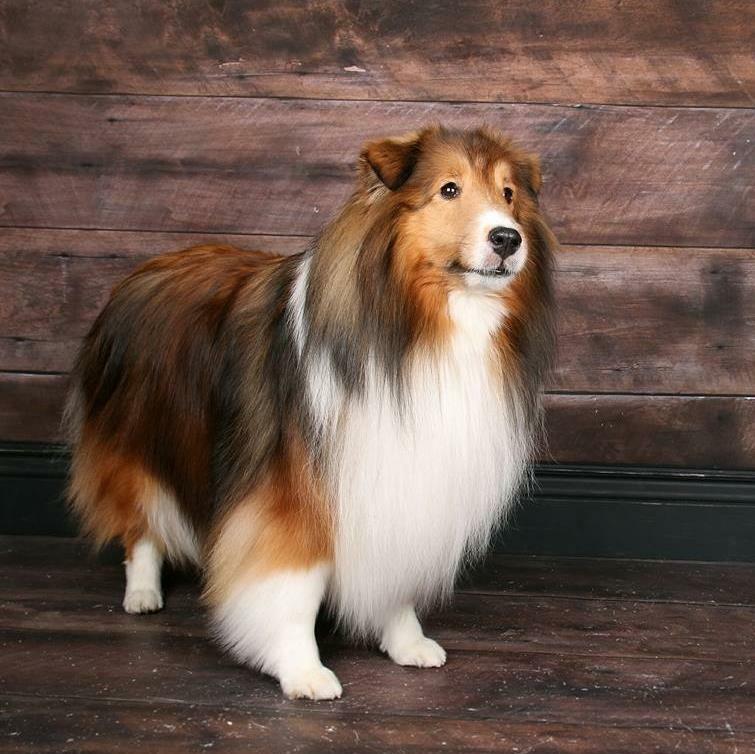 I told him that I wanted a Sheltie – he said no. Why - because they have long hair. 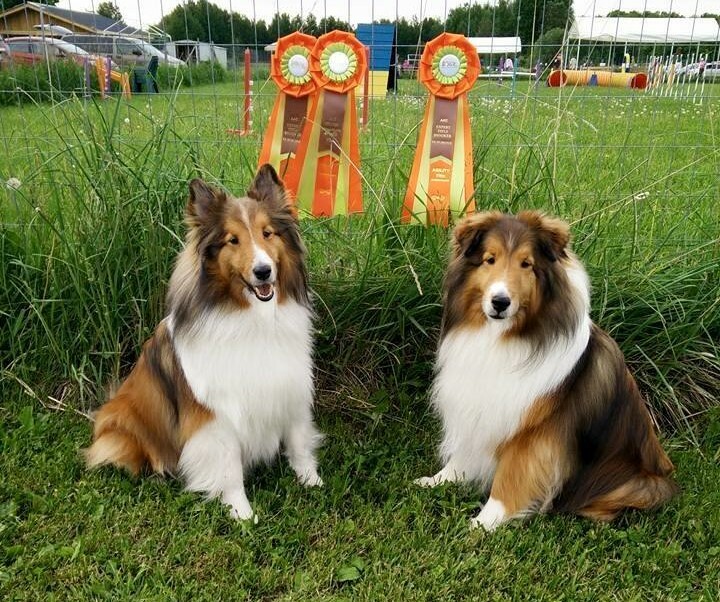 This began a 3 year search for a dog breed that met an ever growing list of “requirements”. It was three years later, on my birthday, that I had had enough – you are suppose to get what you want on your birthday no matter what. 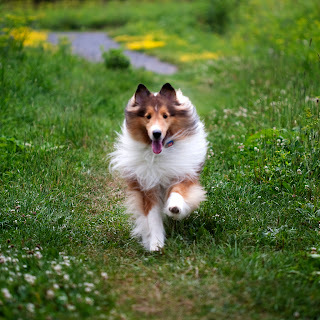 We were not able to find a dog that met his our requirements, so I made the decision – we were getting a Sheltie! Luckily, my husband didn’t protest. I made the exciting announcement to my family at my birthday dinner. Lo-and-behold, a guest told us that her friend was close to a local breeder and they had an older puppy available….the rest they say is history. Since transitioning from “show hopeful” to “family pet” Travis has grown and changed tremendously. 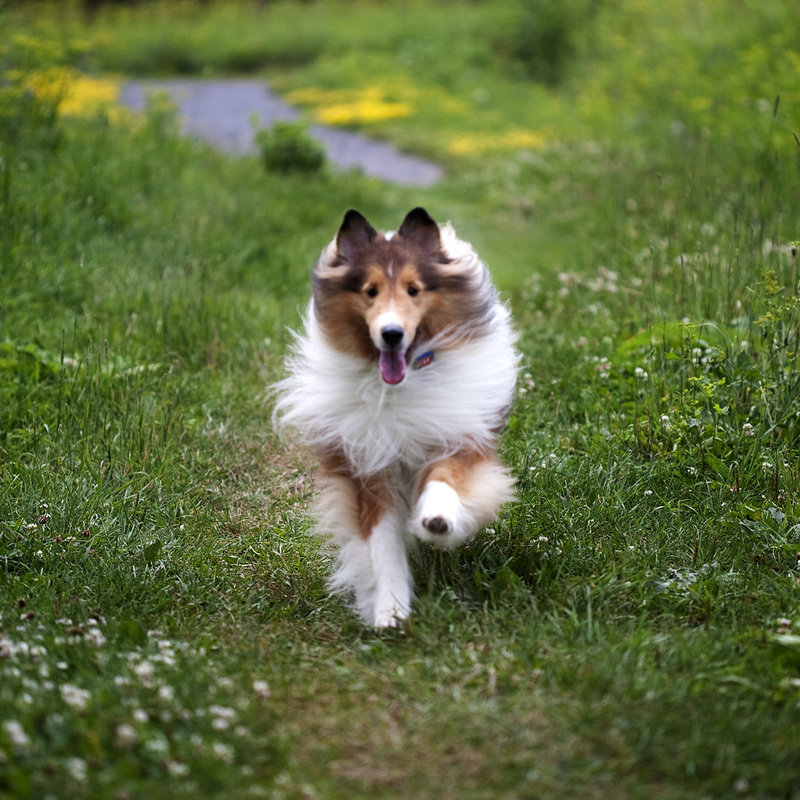 As a 13 month old puppy he was terrified of pretty much everything he encountered and was perplexed by things that we take for granted – like knowing how to walk up and down stairs! Over time we were able to introduce him to all the wonderful things life – as our dog – has to offer. We went hiking and camping, visited the dog park and made lots of doggie/ human friends at day-camp. The most growth has come in that first year – growing together as we learned the great sport of dog agility! 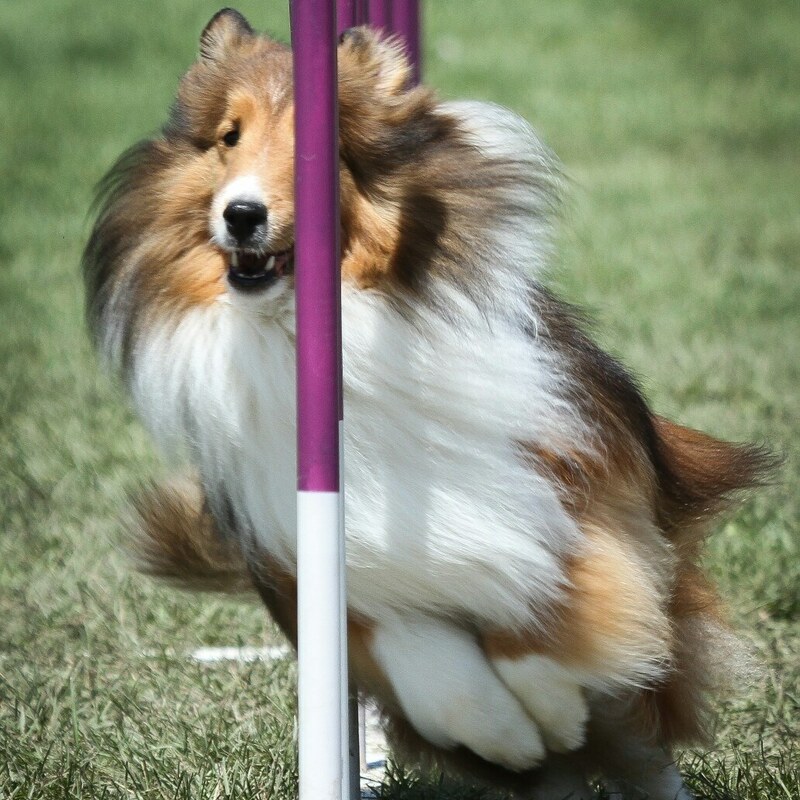 Like all agility dog and handler teams we have had our ups and downs – and not just on the teeter-totter. We aren’t perfect, and we never will be – there’s no fun in perfection anyways. While I think he will forever be my “Velcro dog” Travis has gained confidence and has learned some great problem solving skills through our agility training. 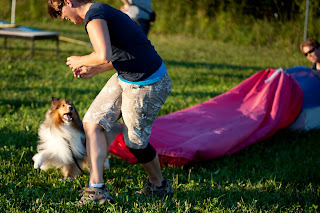 While he would always rather I just give him the answer he’s slowly, slowly, become a thinking dog who wants nothing more than to give his all to me – running his fastest (which happens to only be as fast as I can run) and jump his highest. I have never met a dog before that lights-up with just the words “good boy”. UPDATE 2013 - What a year! A year of changes, trials and tribulations. Travis is thriving on our new handling system. He is running faster than ever an Q'ing in almost every event. Unfortunately his stopped contacts have degraded in competition to the point we decided to semi-retire him for his own safety. We started working on a new training plan and hopefully the new and improved Travis will come out of semi-retirement in mid/late 2014. UPDATE 2014 - Travis remains in semi-retirement mode. The retraining plan went perfectly...kind of. 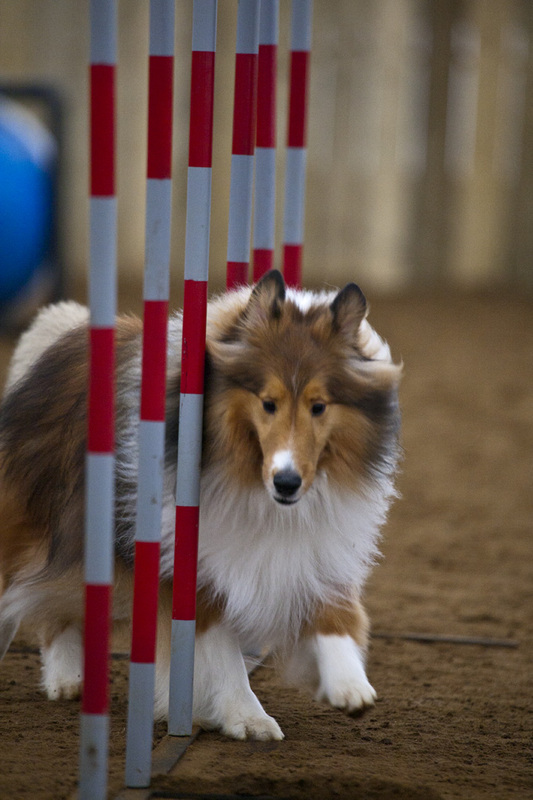 We simply have not been able to transfer the contact behaviour from the training ring to competition. Don't feel sad though, still a bright future for him. UPDATE 2015 - This was a big year of ups and downs for Travis. While he always remained happy, I began to see a decline in Travis' endurance about mid-summer. I started to decrease the amount of training we did, and the number of events I entered him in. When he did run he posted some of his best times ever. 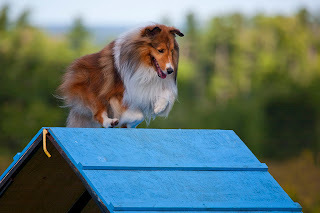 Three weeks after his last agility competition we saw a quick decline in Travis' health. After a week of vet visits the prognosis came back as carcinoma cancer. At this time there is no treatment so we will be making the days he has left as happy, and normal as possible.